NETWORK FINALS: The entire NBC line-up–SUPERSTORE, AP BIO, WILL & GRACE, the CHAMPIONS premiere, and CHICAGO FIRE–was down 0.1 in final numbers, probably due in part to local college basketball tournament preemptions. Also down 0.1: YOUNG SHELDON and SWAT. CABLE HIGHLIGHTS: Thursday cable was all about basketball. TNT’s NBA doubleheader was at 0.74/0.48, and ESPN aired a pair of ACC TOURNAMENT college basketball games at 0.68/0.58. A&E’s 60 DAYS IN gained 0.05 to 0.38. MSNBC’s RACHEL MADDOW SHOW topped cable news again at 0.37/0.54/2.9M, over Fox News’s HANNITY at 0.29/0.53/3M and CNN’s ERIN BURNETT OUTFRONT at 0.27/0.37/1.2M. FX’s ATLANTA fell 0.08 from last week’s season premiere to 0.36. The season finale of Bravo’s TOP CHEF rose 0.07 to 0.33. Nickelodeon’s noon PAW PATROL hit the #11 slot at 0.32. VH1’s RUPAUL’S DRAG RACE crashed by 0.18 to 0.31. On History, SWAMP PEOPLE ticked up to 0.31, and TRUCK NIGHT IN AMERICA arrived at 0.24. Food Network’s BEAT BOBBY FLAY ticked up to 0.29. 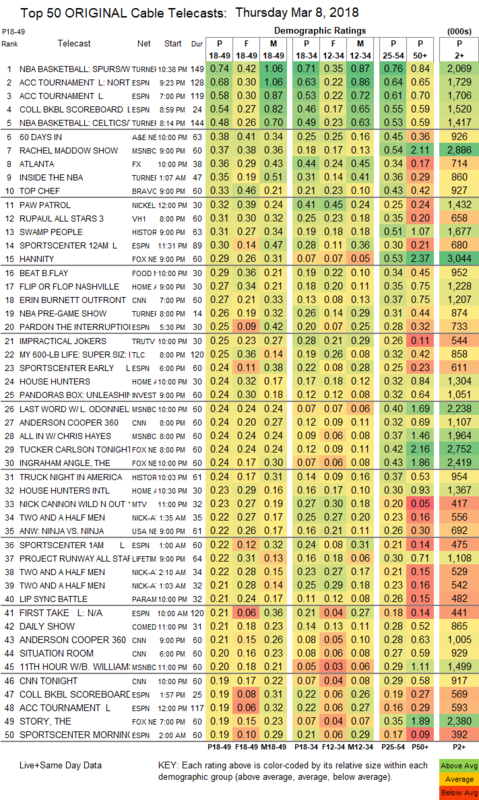 On HGTV, FLIP OR FLOP was steady at 0.27, HOUSE HUNTERS shed 0.03 to 0.24, and HOUSE HUNTERS INTL was down 0.09 to 0.23. 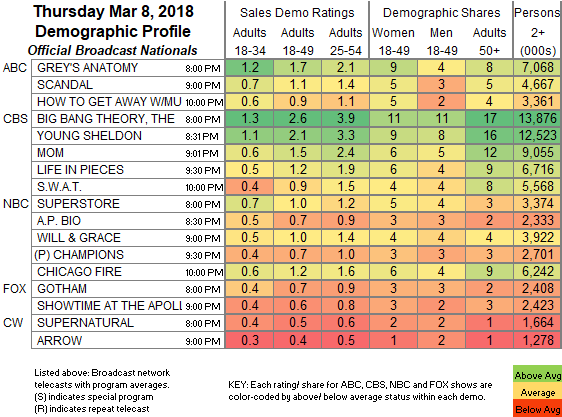 Tru’s IMPRACTICAL JOKERS dropped 0.11 to 0.25. On ID, PANDORA’S BOX held at 0.24. MTV’s WILD N OUT lost 0.04 to 0.22. USA’s AMERICAN NINJA WARRIOR: NINJA VS NINJA ticked up to 0.22. Lifetime’s PROJECT RUNWAY dipped 0.02 to 0.22. Paramount’s LIP SYNC BATTLE ticked up to 0.21. We’s GROWING UP HIP-HOP was down 0.02 to 0.19. POP’s IMPACT WRESTLING dropped 0.03 to 0.07. Freeform’s BEYOND fell 0.04 to 0.05. CMT’s MUSIC CITY lost 0.03 to 0.05. IFC’s PORTLANDIA was steady at 0.03/108K.